The Y is very convenient and affordable for my single-parent timeline and budget. What did you expect from the sports program and how did the Y deliver on these expectations? Considering my son had zero sports experience and he is pretty young, I had limited expectations. In the beginning, he was frustrated that he wasn’t perfect—that he couldn’t “win” every challenge or race. However, all the coaches and staff have been excellent in engaging the kids. They instruct kids in drills and team-building activities, all while allowing each child’s skills to develop at their own pace. It’s pretty cool to witness the development of sports and personal skills. After the first session, his coach encouraged us to stick with it for another session, and then things really started to click. We’ve continued in sports ever since. How have Y sports impacted your son’s life? Even though he isn’t quite on his way to the pros, I’ve seen his confidence grow in so many ways. Before sports classes and sports camp, he didn’t have much for male role models. The coaches and staff have given him good positive male relationship experiences that he can build on. He has learned to properly engage his peers and developed some great friendships. He is learning the importance of following directions, obeying rules, cooperating with others and playing fairly. Especially for younger kids, there are layers to be built and foundations to be laid and the staff does and excellent job of that. It’s really been a great experience and value for us. The summer session of sports classes and leagues starts the week of June 11. 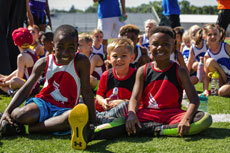 Registration for weeklong summer sports camps is now open. Learn more about sports training options to develop and refine skills.